1. Download and print out the Ornament pattern (PDF here). Cut out the stocking shape, and the optional cuff if you'd like. Note: I apologize for the crappy quality of this pattern. It was made way past my bedtime after caring for a puking, feverish baby all day. He's much better today, thank goodness. 2. Bust out that scrap bin. Select scraps that are least 7 inches long. They don't have to be perfect rectangles or the same width. 3. 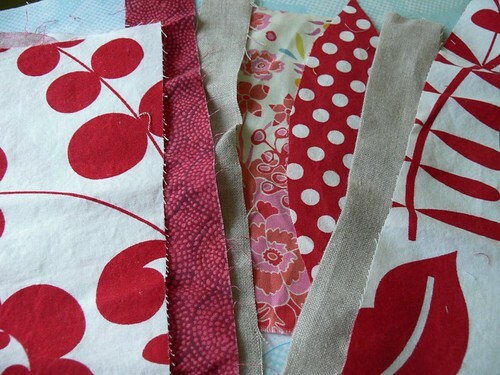 Choose a handful of scraps in a color scheme you like. I went with monochromatic arrangements, combined with some natural linen. 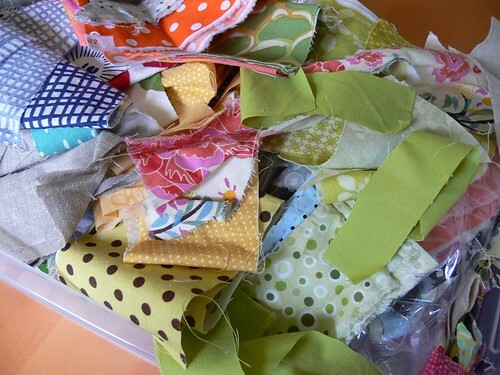 Lay out your scraps in an order that looks pleasing to your eye. 4. Time to sew those scraps together. 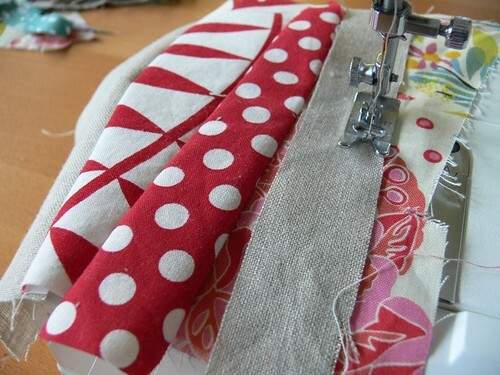 Right sides together and using a 1/4 inch seam allowance, create your scrappy patchwork. The strips don't have to be straight. The wonkier, the better! 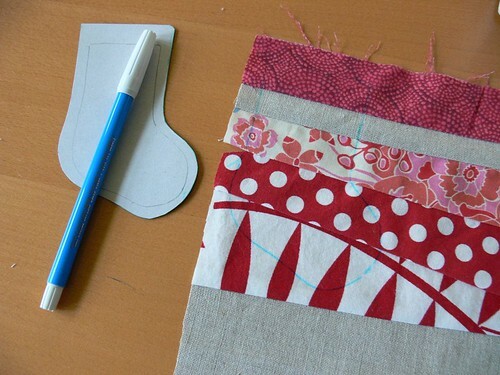 Keep adding strips until you have a piece of patchwork measuring at least 7 inches wide by 5 inches. 5. Press all your seams to one side. 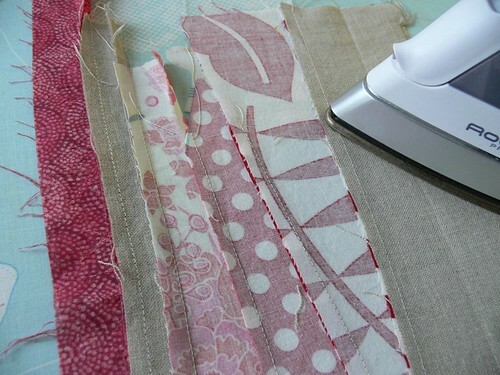 Flip your patchwork over and press from the right side too, to make sure everything is nice and flat. OPTIONAL: At this point, you can add some iron-on lightweight interfacing to the wrong side. It is not necessary, but I think it helps with the structure. 6. 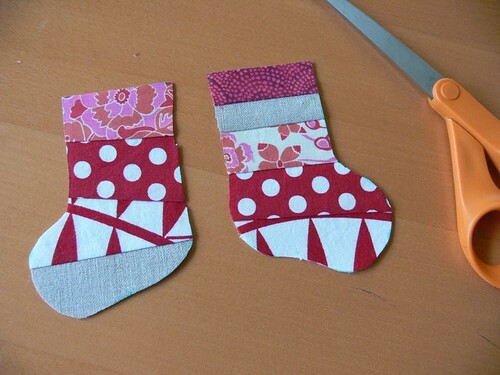 Lay your stocking pattern shape onto the patchwork, find a layout that you like, then trace the shape with the washable marker. (If you're happy with a random layout of prints, then trace your shape on the wrong side of the fabric! I like to see exactly what parts of the different prints are included so I do it on the right side.) 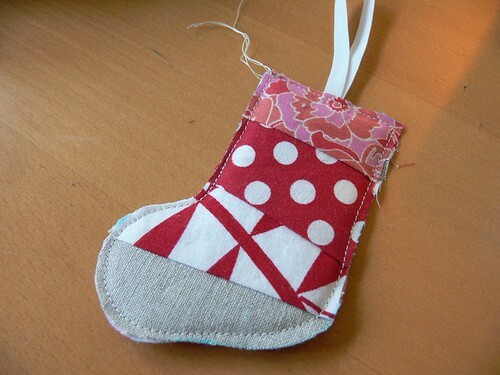 Flip your stocking pattern shape over and trace a second stocking. 7. Carefully cut out your two stocking shapes. 8. 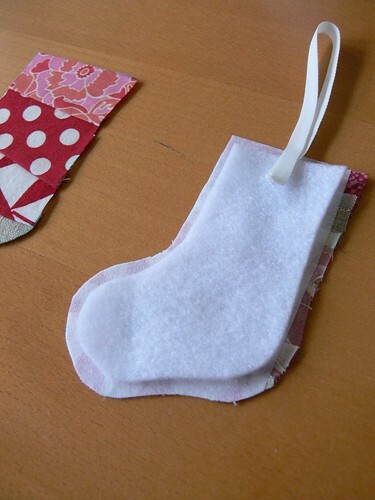 Cut out the smaller stocking shape from batting. Layer it between the two stocking pieces. 9. Cut a length of ribbon or twine that is roughly 7 inches long. 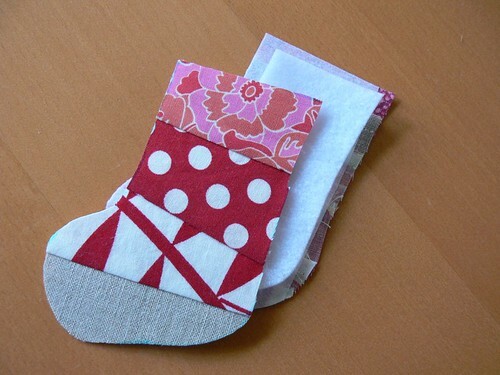 Fold it in half and tuck at least 1/2 inch of the ends between the fabric layers at the top of the stocking. 10. Pin everything carefully. You want to make sure you secure the ribbon or twine at the top, that all edges match, and that the batting is securely in the middle (there should be about 1/4 inch of "free" space all around the batting). 11. 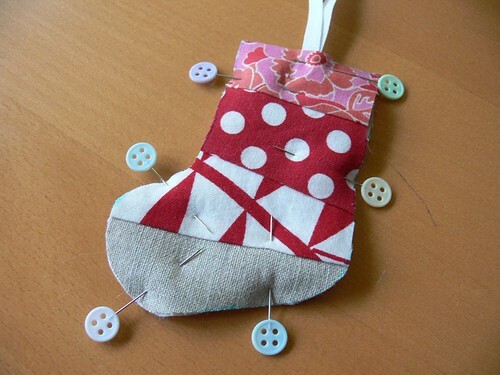 Using your sewing machine, top-stitch all the way around your stocking, removing pins as you go. You'll want to stitch about 1/8 inch from the edge. You can do a straight-stitch like the photo above, double-up the straight stitch or do a zig-zag stitch like the photos below. If your machine is fancier than mine, you could have fun with decorative stitches. Or use a hande needle to embroider a running or blanket stitch. Lots of options here! 12. Trim carefully around the edges. Make sure not to clip any stitches. You just want to clean up the edges and even out the layers. And ta-da you are done! The variations are endless for this design. 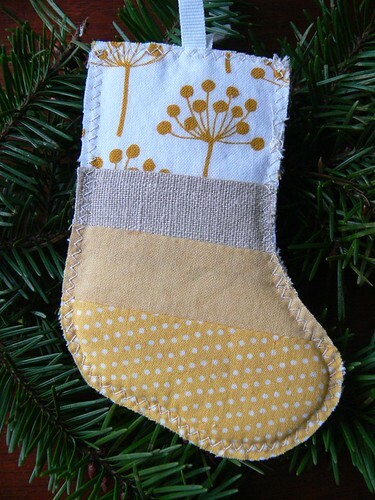 You could line the stocking and leave the top open to create a little pouch and hide a tiny gift. Or increase the size and make it a gift card holder. Or use one piece of fabric instead of patchwork, and embellish with a felt cuff (included in pattern) like I did with this one below. Update 2: Modifications for turning this ornament into a gift card holder are explained briefly in my post about teacher gifts here. What do you think of these little Scrappy Stockings? Are you going to make some? I'd love to see if you do! What are some of your favorite ornaments to make? Please share in the comments. Love these Jen! They are so versatile, I'm thinking of trying the "hide a small gift inside" version for Ian's teachers! So cute! I just got a scrap bag of Sandi Henderson fabric in the mail today and these would be a perfect way to use some of the fabric. I love these...so cute and perfect for scrap stash busting. thanks for sharing. Thank you all! I'm so glad you guys like my little ornaments! Can't wait to see what you make with the tutorial. I haven't downloaded the pattern yet, but I might fold my material in half, draw pattern on one side only, then sew with a straight stitch. Then I will cut out with pinking shears. It should work out okay. Thanks for the great idea. Wow! These are very cute! These are lovely (just repinned them on Pinterest!) - so simple but so effective. I hope you don't mind that I am mentioning them and using a picture(with all the proper credits) in my blog post on Scrappy Christmas ornaments today. Do let me know if you object. Ali, thank you so much! I think it would be fantastic if you'd like to link to this tutorial from your blog today. Thank you kindly for asking permission and wanting to include this project, I sincerely appreciate it. Merci Elodie! Oui, ce blog et ma petite boutique Etsy sont mon travail mi-temps de chez moi. Tu es trop gentille de m'ecrire ce petit mot! Bises a toi aussi. Claire, thank you so much! I checked out your blog post and you are so kind. We really appreciate it and your support. I made pieced five star ornaments this year for the tree, these stockings would go great with the stars. Thanks for sharing. I featured them on my blog as the final round up to a tutorial advent I did. Thank you for making such a fabulous tutorial! So adorable!!! Just in time for an ornament exchange :) Thanks so much! great idea! 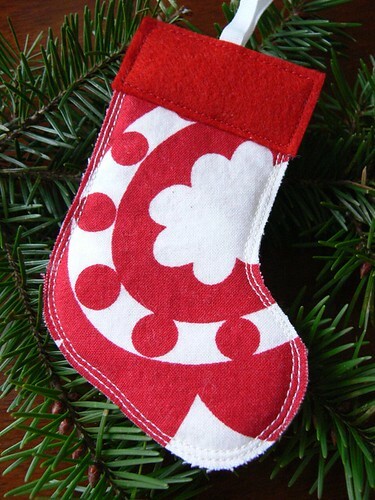 I've been looking for a stocking pattern, and may just use this idea blown up to use for family stockings. 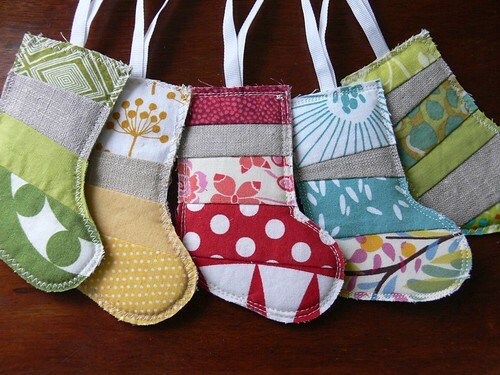 These are so cute, I am making some this weekend. Thanks for the tutorial! Adorable, definitely on the list of things to make. I love these!! 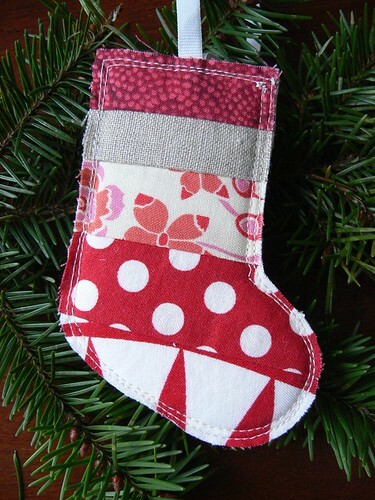 What a great way to use fun fabric. Thanks for sharing. Adorable!! Just adorable...thanks for the tutorial it's easy to follow and understand and I'm going to be trying it out asap...thanks for all your wonderful blogging..merry christmas! These are so cute, what a great idea. I think this would make a great in-the-hoop design! Thanks for sharing! These caught my eyer right away! Consider cutting them out with pinking shears to slow the raveling of the fabric. I've been searching high and low for a small gift for my craft group friends and these are perfectly adorable! Thank you so much for your pattern and instructions! Now....to bust out the scraps!!! Thank you so much. This is just the perfect little personal "tie-on" to my packages this year! Happy Holidays! thanks for such a cute tute - perfect for the scrapes all over my floor! Thank you for such a wonderful tutorial! I am part way through making a couple of gifts for friends which I am now going to abandon to make these. One of my sons is poorly today so I have an unexpected day off work - I'm getting my machine out! Great way to use up all those scraps. Easy and fun! I could do this with my granddaughters. Takes no time at all. Easy peasy! Thanks for sharing. Found these over on Go To Sew.. Super cute. Adorable! I plan to make some of these for friends. I made similar ones like these did it the crazy stripe one, number by number, it took over an hour to do each one, these look so much easier, shame Christmas is opassed, I will have to do these for next year, thanks for the instructions. It's never too early to start Christmas projects. Here are high quality stocking store for women at www.00701.com.